When we talk about ecosystem and how it needs to be maintained we talk about our role, and the role played by a wide variety of animals and birds. Generally, we do not take a very close look at the role insects play in making the word a livable pace. They, however are quietly- and sometimes not so quietly- are doing their job to ensure that the soil remains cultivable, the air breathable, and the food edible. Take, for instance, bees. We all know that they produce honey and wax, but most of us are not aware that these insects play a much more important role in preserving the ecology. 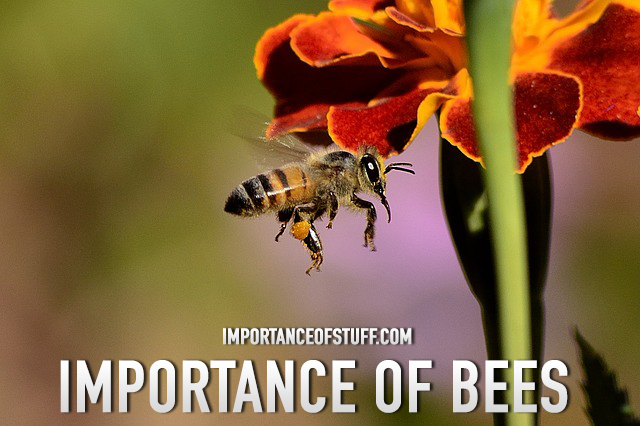 In this article, let us see what makes bees so important to the ecosystem of planet earth. Bees are crucial to the process of pollination. Pollination is defined as the process of transferring the pollen from the anther- the ale part of the flower- to the stigma, the female part of the flower. Some plants can pollinate themselves, while others rely on the wind, birds, insects, and animals to spread the pollen. Bees have a tendency to concentrate on a single species of plant, so that the quality of pollination is much higher. This is because this reduces the chance of the pollen spreading to different species, where it will not be pollinated and the pollen will be wasted. And why is pollination important? This is because it is the process through which flowers, seeds, and fruit that we rely on for food are formed; if pollination is not of good quality or does not occur at all, our food supply would be severely limited. Important crops included in our daily consumption, such as watermelons, cranberries, apples, cantaloupes, cherries, asparagus, and broccoli, among others, rely principally on bees for their pollination. The principal products we receive directly from bees are honey and wax. While the honey is produced by the bees as a store for its food in winter, humans have found much enjoyment in and use of this amber liquid; honey is one of the most expensive crops on the planet. The reason is simple; not only is honey a delicious ingredient that is consumed by itself and added in a wide variety of food and other condiments, it also has considerable medicinal properties hat make it an essential ingredient in medicines such as cough syrups, cold medication, and weight loss products. The other produce from bees that has found widespread use in the human world is wax. Beeswax is the primary source of wax in the world, and is used in making a variety of objects. The commonest use of wax is, of course, candles; apart from that, beeswax is also used in a variety of cosmetic products such as cold creams, moisturizers, lotions, lipstick, lip-gloss, and salves. It is also used as a food additive and a glazing agent. In some cases, beeswax is also used for the soft casing on tablets and capsules. Polish of different kinds, such s those used on shoes and furniture, have beeswax as a principal ingredient. One of the more important uses is in surgery; beeswax is a main ingredient in making the surgical bone wax that is used to prevent bleeding from bone surfaces. The importance of bees, however, is not just limited to commercial purposes, although their importance cannot be undermined. Bees help in pollinating, which mean that they contribute significantly to maintaining the green cover of the earth. Besides, they also help in producing food for the other living species in the world via pollinating. Apart from that, their function in beautifying the earth cannot be denied. Since they must pollinate as part of their survival process, they lead to spreading of different kinds of plants. In the process, they also help to create an attractive and sustainable habitat for a wide variety of different species. The test of this is simple; if you have a garden and allow a beehive to grow, you will be amazed at the number of plants that will crop up season after season all by themselves. And because these plants provide food for fauna, you will likely attract a variety of different animal and bird species that will arrive to take shelter in the habitat created for them by the bees. Today, these wonderful insects are at the risk of becoming endangered, and it is important that we do all that we can to prevent their extinction from taking place. Several steps are already in place to help them grow safely, but more needs to be done. After all, it is not just for them that we need the bees to live; they are essential for us if we wish to continue living healthily on a livable planet.